Furmint is a white grape best known in the Tokaj region of Hungary. It can also be found in other parts of the country and beyond, including Slovenia, Croatia (under the name Šipon), Austria and South Africa. The Furmint grape is best known for the decadently sweet Tokaji dessert wine, though it also produces excellent dry white wines in that region and elsewhere. The flavor profile of Furmint can vary according to the style of wine, though there are some distinguishing characteristics. Furmint wines tend to be high in acidity, as well as highly concentrated in both flavor and aroma. Young Furmints tend to show aromas of apples and flowers, which over time give way to mature notes of nuts and honey. The alcohol content in Furmint wines can be high by white wine standards, easily reaching 14% alcohol by volume. 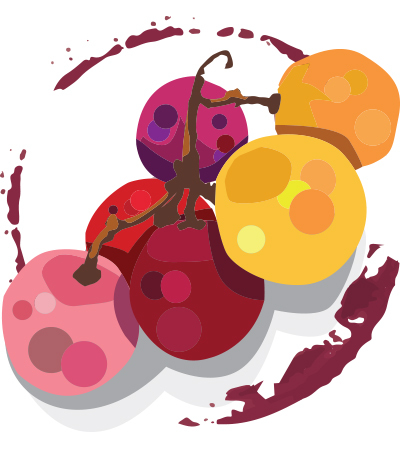 The grape is highly susceptible to botrytis, the so-called “noble rot” responsible for the great dessert wines of Tokaji (and Sauternes in Bordeaux, France, though the grape varieties used there are different). Sweet Tokaji is produced in a range of sweetness levels, indicated by Puttonyos, a unit of measure for the level of residual sugar in the wine. The Puttonyos level traditionally referred to the number of tubs, called puttonyos or hods, of aszú (Hungarian for dried) berries—meaning those infected with botrytis—that were added to each barrel of the base wine that’s made from unbotrytized grapes. Puttonyos are measured on a scale of one to six; the more puttonyos, the sweeter, richer and rarer the Tokaji. Tokaji Aszú wines are very high in acidity, striking a delicate and refreshing balance with their high sugar content. Sweet Tokaji tends to have a deep amber color and high concentration of aromas and flavors including marmalade, apricot and honey. While Furmint is the most important grape here, these wines may also contain Hárslevelű—another grape variety that is conveniently prone to botrytis—and Sárga Muscotály, better known as Muscat Blanc à Petit Grains. Beyond Tokaji Aszú 6 Puttonyos is Tokaji Eszencia, one of the most exclusive and expensive wines in the world, although it technically doesn’t even qualify to be called a wine since it is so sweet—between 500–700g/L residual sugar—it rarely ferments to above 5–6% abv. Unlike most wine, Eszencia is known to be able to cellar for lifetimes, for hundreds of years, even. Dry Tokaji wines can also be blends or single varietals, and Tokaji Furmint is the most common single varietal. Styles can vary from light and simple to concentrated and age-worthy. Simpler styles tend to be unoaked, fresh, fruity and are intended to be consumed young. Premium examples of Tokaji Furmint may have been fermented or aged in new oak, leading to higher ageing potential and more complex aromas and flavors. Scroll down to view Wine Enthusiast’s online Buying Guide, from which you can find the top-rated Furmint among our extensive wine reviews and collection of related articles.